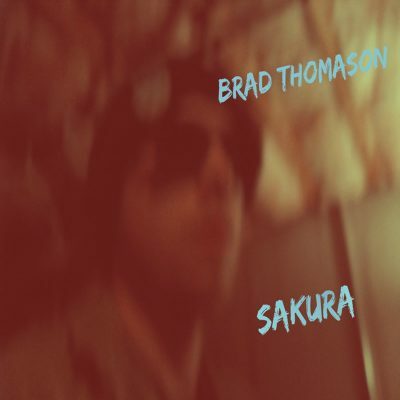 Sakura is a 4-song EP and the first in a series of releases leading up to Brad Thomason’s upcoming LP. This EP has a big job on its shoulders, and that’s introducing the vision has for his album and how he executes it. It’s the perfect sampler for everything Thomason has in store, with some unexpected twists and turns upon my first listen. According to Thomason’s Bandcamp page, “The Pacific Clone” is a tale about what music would become in a post-apocalyptic setting. The first song on the track is described by Thomason as “A snippet of a broadcast from KVWC 98.3, the ever popular laid back dad rock station.” It’s a quirky introduction to this piece, but its out-of-this-dimension feel truly sets the tone for the EP. The crumbly, staticky soundwaves tickle my ears until a cheesy drumbeat kicks in and welcomes a voice that very much resembles Tim Burton’s Beetle Juice. This definitely wasn’t what I was expecting, but it’s a crucial element when it comes to understanding this EP, and eventually the entire album. The second track is a sweet indie jam called “You’ve Got What I Need.” It’s a dreamy track with adorable lyrics sung by whispery vocals. It’s a peppy song that reminds me of a sunny day, lemonade and admiration. Every element about the song promotes feeling good. The riffs are dance-y, and the drums are consistent and mellow—it’s the perfect taste of Thomason’s playful and fun sound. Everything about this EP is satisfying. It’s a fun, out-of-the-box release that I can really appreciate. Having this backstory to hold the listener’s hand throughout (what will be) the entire album adds interest to the piece, rather than it just being a collection of songs. It’s attention-grabbing while also mellow, and easy to bob your head to. This EP does the job of building anticipation for the final LP release, and it showcases Thomason’s creativity in fun, simple ways. Sakura, as well as the second EP and the final LP are all pieces I’m looking forward to jamming to when I need something smooth, easy on the ears and enjoyable.